Somehow, it doesn’t seem right that the #BLOTUS should be allowed to continue ignoring the wishes of Congress. Just like, Is there no accountability? Trump needs to be impeached as rapidly as possible. He is a traitor that cares for no one but himself. 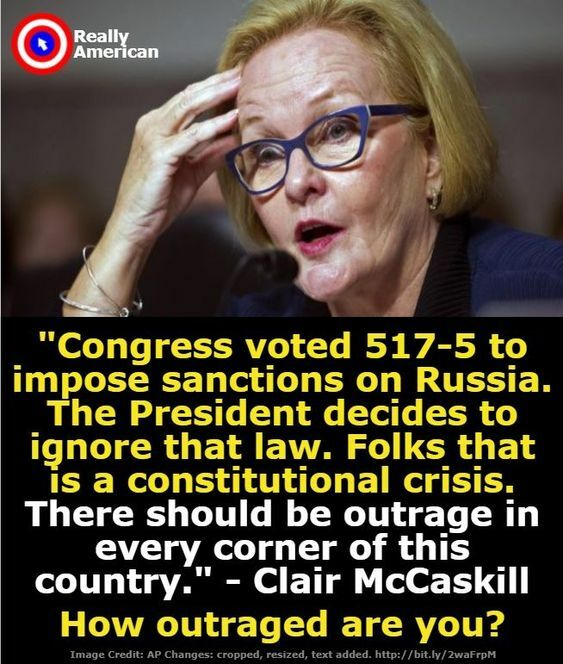 This entry was posted in Facts & Statistics, News & Views, Quotes and tagged anger, BLOTUS, Claire McCaskill, CONSTITUTIONAL CRISIS, ego, impeachment, law, outrage, President, really American, rule of law, Russia, sanctions, self-centered, traitor, Trump on February 6, 2018 by Ray Buchanan.